“Bonchan” (right) against Xiaobao of Taiwan, who he defeated in the grand finals of Saigon Cup. Photo via the Saigon FGC Facebook page. Masato “Bonchan” Takahashi is on a tear in the Street Fighter V community, earning three straight victories at the most recent Capcom Pro Tour events. While an impressive feat on its own, the Japanese competitor did so over just three weeks at events in Europe, Australia and Asia, utilizing a character many of his contemporaries have given up on. Bonchan’s string of wins began the weekend of May 6 at The Colosseum, an Italian fighting game event featuring some of the best players from Europe as well as notable visitors from across the globe. Following a disappointing 25th place finish at DreamHack Austin just a week beforehand, Bonchan tore through The Colosseum’s Street Fighter V bracket, demolishing everyone who stood in his way with Charlie Nash. His warpath included near-perfect victories over players like Algerian-born Emirati competitor Adel “Big Bird” Anouche and Li-wei “Oil King” Lin of Taiwan, both of whom are known for overwhelming displays of their own. A week later, Bonchan traveled to Battle Arena Melbourne (the site of Daigo Umehara’s embarrassing self-own), an arguably fiercer event thanks to Australia’s proximity to the dominant Asian nations. The finals bracket saw Bonchan face off against Seon-woo “Infiltration” Lee and Atsushi “yukadon” Fujimura early on, notable for the fact they had previously placed first and third respectively at Evo 2016 with Nash but have since left him behind in search of new characters. Bonchan again persevered, fending off South Korean upstart Hyung-suk “Verloren” Kong to earn his second straight victory in as many weeks. 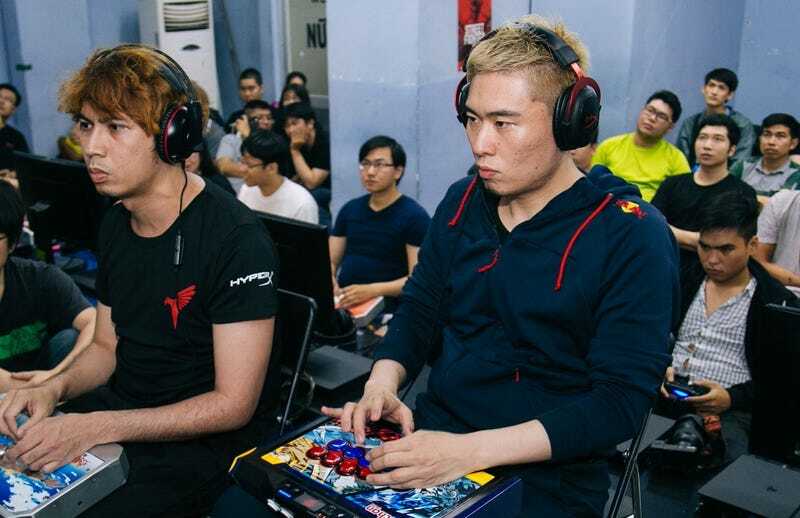 Bonchan played in Vietnam on May 20. Unlike The Colosseum and Battle Arena Melbourne, Saigon Cup featured a significant Chinese presence. Many of those players rarely leave their home country to compete. Although he had a much tougher time, Bonchan was again able to defeat Oil King’s potent Rashid, squeak past countryman Hajime “Tokido” Taniguchi, and finally sweep Taiwanese sleeper Sian-he “Xiaobao” Jung, ending the tournament with a perfect. Humble as he may be, Bonchan has long been considered one of the best fighting game players in the world, stretching back to the early days of Street Fighter IV. But even the best competitors can be shaken by a frenetic travel schedule. This makes grabbing sleep whenever you can and (for better or worse) keeping energy drinks handy a must, Bonchan said. As a sponsored player, Bonchan’s opportunities to travel have increased immensely. He’s sponsored by Red Bull, which, full disclosure, runs an esports site that I sometimes write for. Bonchan says the sponsorship helped him travel the world and that, prior to getting it, he was only able to travel outside his native Japan maybe four times a year. His new, busier travel schedule has helped him, because getting around to tournaments has become more important thanks to the Capcom Pro Tour. The worldwide circuit incentivizes players to visit as many events as possible to qualify for the end-of-year Capcom Cup and its $250,000 prize pool. Many attribute Bonchan’s struggles to his devotion to Nash, the returning character that inundated the first year of Street Fighter V competition. In an effort to make the majority of the character’s moveset viable for competitive play, Capcom’s season two balance changes weakened Nash overall by kneecapping his hit-and-run offense and adjusting his normal attack hitboxes, making them more easily counterable.. Subsequent patches have yet to fix the character, as far as the competitive community is concerned. Bonchan plans to make the switch to Sagat (his Street Fighter IV main) should he ever join the Street Fighter V cast. “He is special to me,” he added. The points Bonchan has earned towards qualifying for Capcom Cup will afford him a couple weeks off—after completing Red Bull Kumite in Paris, France this coming weekend. The invitational will feature competition in the form of his Red Bull teammates Olivier “Luffy” Hay and Darryl “Snake Eyez” Lewis, as well as international competition like China’s Zhuo-jun “Xiaohai” Zeng, Arman “Phenom” Hanjani of Norway, and Eduardo “PR Balrog” Perez. Bonchan somehow plans to squeeze some much-needed rest between Red Bull Kumite and his ongoing series of road trips through Japan, making appearances in the country’s many prefectures in hopes that he can stimulate local Street Fighter V communities that may be dwindling due to the game’s lack of an arcade release. Ian Walker is a fighting game expert and freelance writer. You can find him on Twitter at @iantothemax.